It’s Finished Quilt Friday! This quilt took a little while, but it helps when you are in love with the colors and fabric. 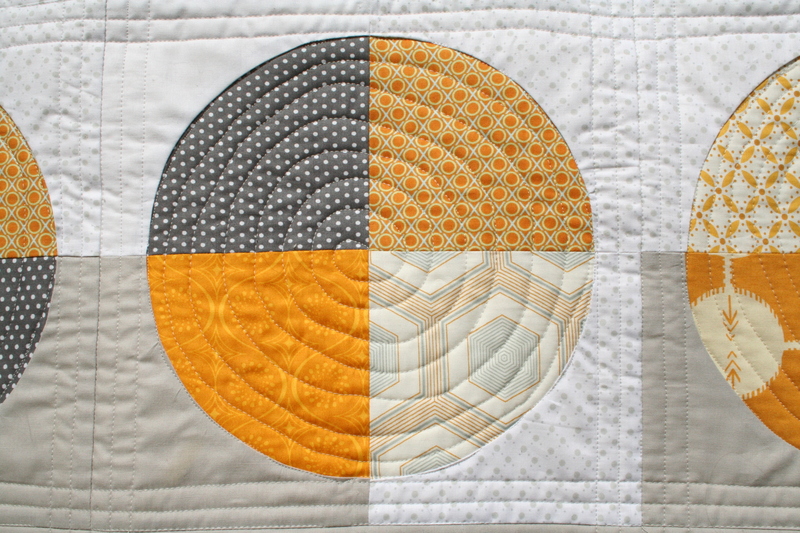 I decided to tackle circles, something that I’ve wanted to make to expand my quilting skill set. I got some encouragement from experienced quilters and sought out tutorials. After making a few test blocks I bought some drunkard’s path rulers and went to town with my stash. Thirty six blocks later I got the hang of it. It was slow going but I’m so happy to have the confidence to use curves in the future. Here’s to practice, research and stepping outside your comfort zone. 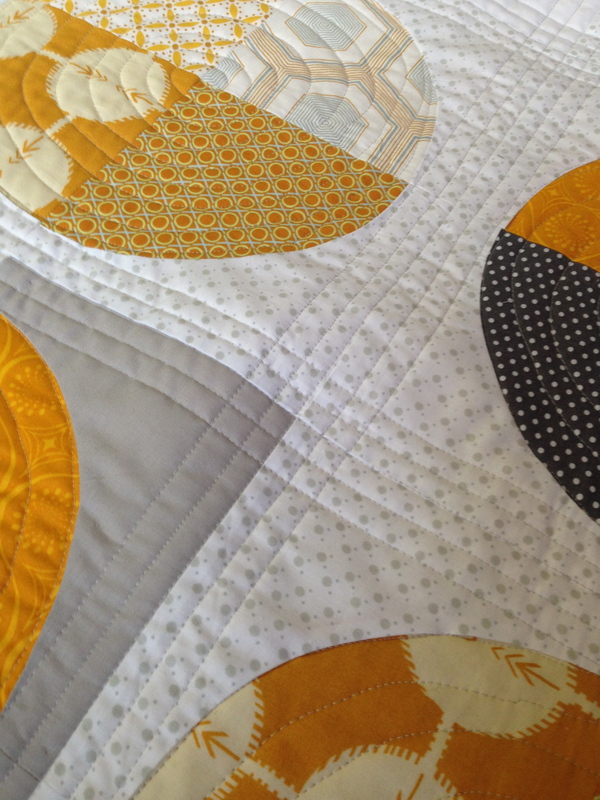 This golden yellow was never a color that I gravitated to until I started quilting, and now it’s my favorite color. There’s something about a bright pop of gold that brightens a room. I even think yellow quilts are warmer. It helped a lot in this seemingly endless winter to have something bright and beautiful in the work room. I had a ton of hoarded yellow in my stash, so I’m not exactly sure what everything is (there’s some Anna Maria, some Thomas Knauer and Simply Color). I balanced it out with charcoal dots in the circles (acquired in SF) and Kona Ash around them. The background dots and the binding are both Dear Stella. I especially love that the fabrics all feature round shapes except for angles on the binding. Circles all around (see what I did there? tip your waitress!). 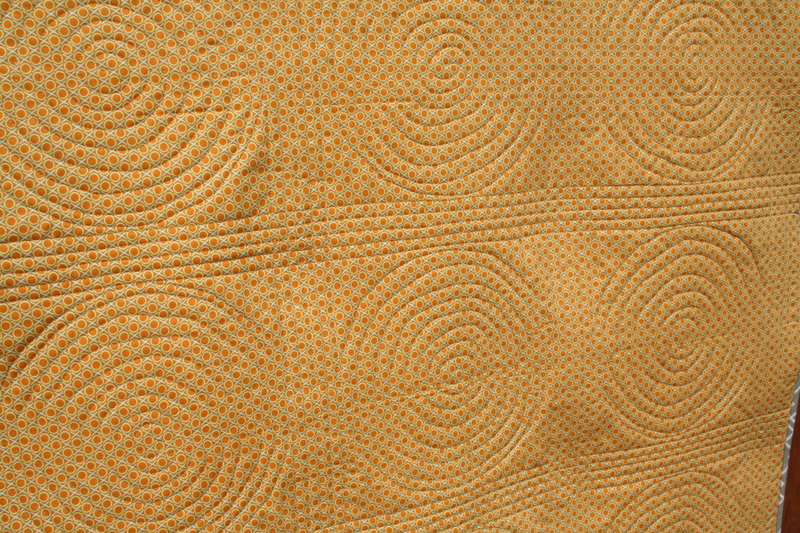 I free motion quilted spirals into the circles and quilted straight lines in the negative space. I tried to keep all of the lines about 1/2″ apart. I love the little grids made when the lines intersect. I usually only like to use thread lighter than the fabric I’m working with, but I thought that silver looked really cool on the white and the prints. It’s Aurifil 2615 50wt. To bind, I decided to try a machine binding technique that my friend Ashley swears by. 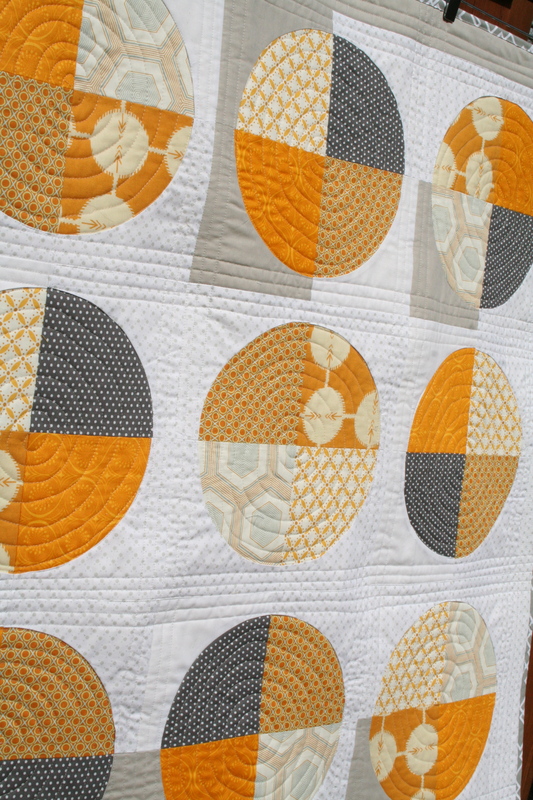 She took my Beginning Quilting class a while back and then tweaked the traditional binding methods I teach to make something that works for her. And it was amazing! If you want a quick and attractive way to machine bind, check out her tutorial. 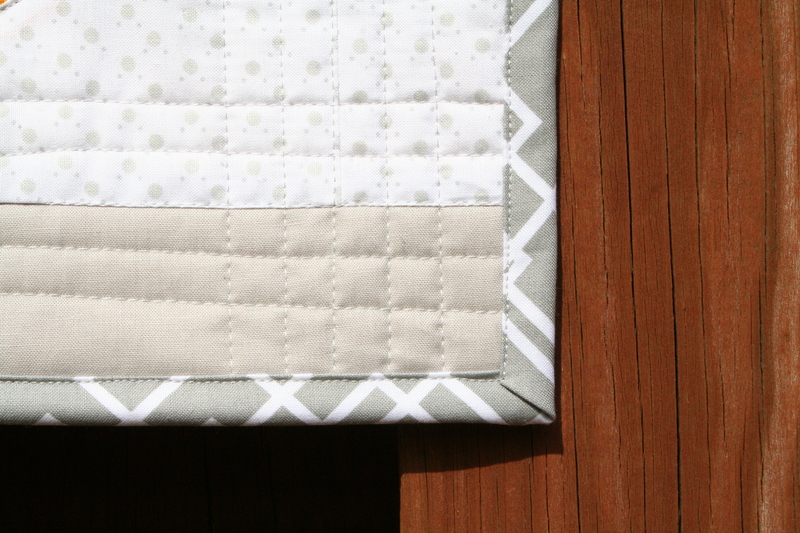 It measures 40″ square and will be a perfect baby quilt for a stroller or play mat. I hope your weekend is yellow. Nice work, you got it done in time for a Friday Finish after all! It’s lovely, and it glows. Thanks for the encouragement, Kate! I definitely thought of you and the bloggy friends when carving out my binding time. 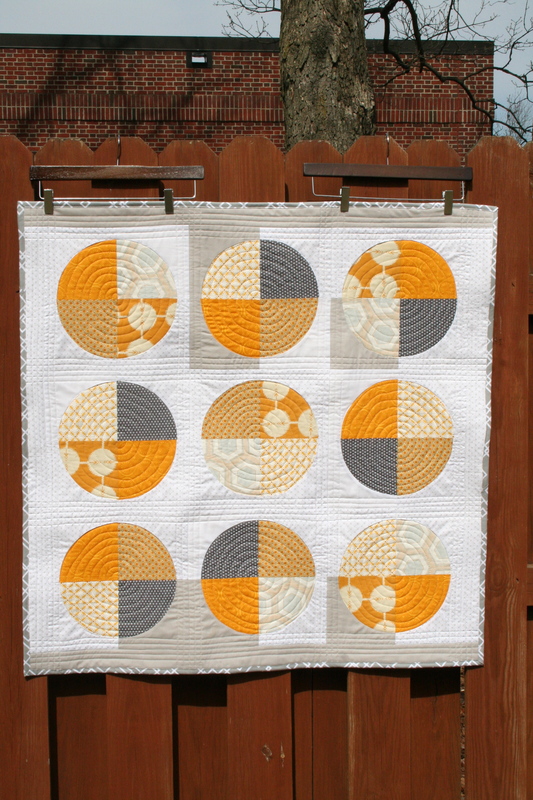 The colors are wonderful and the quilting is Great! What a wonderful gift! I can’t wait to gift it! Thanks for visiting and commenting! It turned out great! I do love the silver thread and the binding! Thanks Renee! I wasn’t crazy about how the binding looked with the backing but I didn’t want to go too dark or bright and it’s one of my favorite all-time binding prints. It’s so tempting to Monday morning quarterback when it’s done! This is lovely!! Your skill set is growing. Thanks for brightening this dismal season. Thanks, Mom. I’ve been subconsciously brightening my dismal winter with yellow. I was just making things I liked and then thought about why after the fact. This turned out great and I love the colors too!